HomeSearch result for "bachs sons"
“This music is in the best of hands with the Freiburg Baroque Orchestra” is the qualified judgment of the trade magazine Fono Forum about the Freiburg Baroque Orchestra’s “Bach-Söhne” (Sons of J.S. 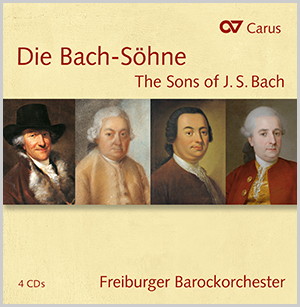 Bach) series issued by Carus-Verlag. With their recordings of numerous orchestral works and concerts by all four of Johann Sebastian Bach’s sons, the Freiburg Baroque Orchestra did justice to its trademark – a high standard of performance, pleasure in experimentation and a passion for music-making – time and again. This series, which has won several awards, is now available for the first time in a box set of 4 CDs. This results in an impressive panorama of the era that lies between Baroque and Classic. Wollte man die ganze Fülle kostbarer Details der musikalischen Umsetzung verdeutlichen, würde dieser Text ausufern. ... Eine Wohltat! L’Orchestre Baroque de Freiburg […] excelle en puissance et en sensibilité.